Alexandria Winslow has not lived in Southern Arizona her entire life, but when she arrived in 1982 it was clear to her that the dramatic landscape hit all the high notes of visual beauty she had been longing for as an artist. Her art had always been about nature and wildlife so the Sonoran Desert full of color and drama really appealed to her passion for drawing and painting. Slowly, she left behind the earthy colors of the past and fully embraced the vibrant palette of the desert landscape. As a young woman she had painted in oils and watercolor but when she tried working with acrylic, it soon became her medium of choice. She loved the quick drying process that allowed her to layer colors in a short period of time. She truly embraced the medium and has discovered a whole new world of creative inspiration. Fast forward several decades and Alexandria is full of creative energy that pushes her to new levels of expression, experimentation and immersion in the local and regional culture. 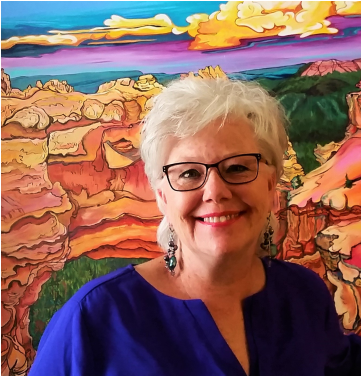 As a lover of nature she hikes, camps and travels in Arizona, Utah and New Mexico where she is rewarded with an abundance of resource for her paintings. Her work is a reflection of these journeys as well as a mindset of wonderment that translates onto her canvas. She tries to express the universal feelings of connection, joy, and passion for the world around us. As you look at a collection of her works, it is clear that the natural world she expresses in her art is fun, whimsical, joyful, imaginative and sometimes outside the box. The art of Alexandria Winslow is representational with a twist of whimsy in a high definition style. When she was young she fell in love with illustration and poster art, which is clearly evident in her technique and style today. In college she was drawn to graphic and interior design, which can easily be seen in her current work. Alexandria’s style is always a work in progress yet easily recognizable. For her, it is all about placement, contrast and composition, then throw in vibrant color and voila! Regional culture has been a great influence on how her work has evolved over the years and she is currently exploring the Day of the Dead. Using her trademark style she was inspired to paint the landscape and wildlife of the Sonoran Desert from this perspective, as a prompt to the viewer to think about the conservation of our desert eco system. several show posters including " Old Tucson Studios" who owns the original "Music in the Desert". They have it on display in their museum collection. The University of Arizona has a permanent collection of her work in the Eller College of Business. Aesthetics Inc. of California has 3 pieces of her work in the Children's Hospital Central California. © 2009-2019 Alexandria Winslow. All rights reserved. without written permission from the copyright holder.